"Once again, Martha has captured the complexity and nuance of the role of the modern day CIO, and woven it into an engaging, actionable resource for IT professionals." "In the new digital landscape, IT is no longer a support function about the business; it is a fundamental building block of the business. This requires CIOs and their colleagues to reconstruct the IT function top to bottom, and Be the Business provides a wealth of good ideas for how to do so." "Technology has moved to the center of every business and the list of critical competencies required of CIOs has taken yet another giant leap forward. Martha has drawn from her executive recruiting and journalism skills to create an authoritative profile of a high performing CIO in the digital era." "Martha Heller is exactly right: Technology really *is* the business today, and CIOs play a more crucial role than ever before in accelerating that business. With keen observations drawn directly from her vast network of successful Fortune 1000 executives, Martha brings a refreshingly practical point of view to the fast-evolving role of technology leaders in today’s enterprise." "Martha clearly identifies the increasing expectations of CEOs and corporate boards in regards to their CIOs. They must be business savvy product managers capable of defining and selling solutions that become the business products of the future. Be the Business is vital reading for CIOs of today and tomorrow!" "In this easy and worthy read, we are reminded that the days of any chasm between a business and the technology required to run and enhance it are long gone. The business and IT need to be one. To this veteran CIO and CTO, Be the Business is a refreshing and current book that must be embraced." "The new era of IT is changing traditional business models and asking more from CIOs. Martha provides a compelling guide based on tangible business trends and pragmatic advice from pioneering technology leaders…a must-read for any business leader confronted by digital disruption." 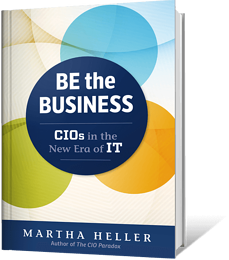 "In Be the Business, Martha Heller is spot on about today’s CIO. We can no longer just be order takers. We need to bring value to the business and show them what is possible!" "As a trusted advisor to many CIOs, and the CEOs that hire them, Martha has learned what it takes for CIOs to tear down the walls between IT and the business. Be the Business is an indispensable handbook — based on true stories and lessons — for every IT leader on becoming an essential business partner." "CIOs have earned a pole position in the race to digital, but it goes far beyond technological advancements. As Martha Heller presents so compellingly in Be the Business, it’s about tapping into our enterprise view to unify an ecosystem of interdependent beliefs, processes and data to influence change." "Martha Heller provides practical advice from her enormous network of CIOs on how to take a leadership role in digital transformation, and increase the value technology contributes to the enterprise. Be the Business is an essential guide for CIOs to navigate the path forward." "Be the Business is an essential reskilling guide for smart CIOs who are prepared to shed their roles as technology quarterbacks and start becoming technology coaches." "Martha hit the nail on the head. CIOs can no longer be the sole provider of all things technological. Our role needs to become the enabler of innovation and digitization but in a secure, resilient, and well-architected ecosystem." In The CIO Paradox, Martha Heller has clearly articulated the many contradictions that permeate the CIO role. But more than that, she includes rich examples of how successful CIOs have managed to break through these contradictions. IT leadership is a balancing act, as Heller demonstrates in this entertaining and insightful book." "Martha Heller has unparalleled access to CIOs. She advises them, writes about them, and recruits them. With her terrific book, The CIO Paradox, she lets us in on all that she has learned and the advice she has given. The result is an invaluable resource. Martha demonstrates that for CIOs to be successful in this day and age, they must achieve balance in their skills, plans, and methods to eliminate blind spots and to achieve sustainable success for their departments and for their companies." "Martha does a great job of capturing the paradox of not just the CIO role, but of Enterprise IT as a whole. In a world that greatly admires technology and over-rewards the start-up, how is the brand of the enterprise CIO and the technology teams that support our business so weak? As a CIO that has survived this paradox for more than a decade, I appreciate the insights of The CIO Paradox." "A must-read for all CIOs and those aspiring to the role. The CIO Paradox is a compendium of our colleagues’ most valuable and sometimes painful lessons packaged up and told in a compelling and straightforward manner. Thanks, Martha!" 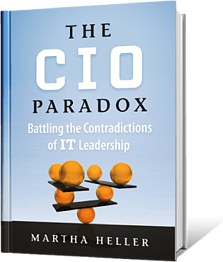 "What makes The CIO Paradox a compelling read is the understanding Martha has of the vast challenges today’s CIOs are faced with. Throughout the book you have those aha! moments that energize any reader who works in or supports the IT profession. The organized, blunt fashion in which she states the paradox, while injecting the perfect amount of humor, is terrific, as are her conclusions. This is not a book about IT that will bore you!" "In The CIO Paradox, Heller has her finger on the pulse of the major contradictions that plague the CIO role today, including being hired to be strategic, but spending most of our time being operational. Her recommendations on how to overcome major paradoxes offer concise and helpful advice to CIOs on becoming more successful in the role." "Martha Heller has captured the essence of the exhilaration and the stress that come with being a CIO in the 21st century. In The CIO Paradox, she has articulated the complex and critical set of issues that confront CIOs every day, in every enterprise, in a witty and constructive way. Having lived the CIO role over four different decades, I was able to relate to her paradoxes and her conclusions: that to be successful in this young and great profession you must move from being an either, or manager to an and, and leader. It will be exciting to see more and more of our next generation leaders break through these paradoxes."